A 401k Plan is a valuable employee benefit and a strong talent retention tool for your business; however, it also places “fiduciary” responsibilities on your shoulders. We educate you on ERISA’s five key mandates (see 401k ERISA Services) and your related fiduciary duties, so you can be comfortable with your compliance. We help you implement prudent processes to protect your interests, reduce risk, and limit liability. Risk: You can’t eliminate your fiduciary responsibility to interpret, select, and monitor Plan activity; however, you can choose providers with transparent business practices that mitigate your risks and provide better 401k Plan economics. Take care to understand the difference between slick marketing that offers fiduciary assistance and legal substance. A 3 (21) Adviser shares risk with you, but you still have the ultimate investment authority (and liability); whereas a 3 (38) Manager is ERISA’s highest standard of care and removes your investment liability. Does your adviser offer you 3 (38) protection in a clear, written agreement? Participant Education: Retirement readiness is important to all participants. If not properly funded and invested, many 401k plans will fail to provide needed retirement funds. Our education programs review important, practical investment concepts like appropriate savings levels, risk, return, dollar cost averaging, compound interest, and accumulation and distribution. We also offer individual advice if so desired. Fees & Costs: The Tibble v Edison Supreme Court mandates your diligence in monitoring 401k plan fees. You are responsible for ensuring 401k plan costs are “reasonable.” Complex,conflicted compensation schemes can make it difficult for you to clearly assess 401k plan fee levels. Our transparent competitive review will simplify this for you, and benchmark fees and services so you can meet the “reasonable” fee standard with confidence. 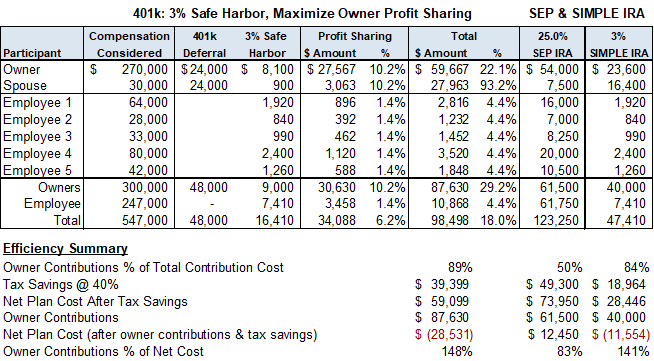 Plan Contributions: If your top priority is to optimize your contributions or those of other highly compensated employees, 401k plan design becomes very important. Once we have collected your employee census data we can run the numbers, assess your options, and see where we can improve your results. 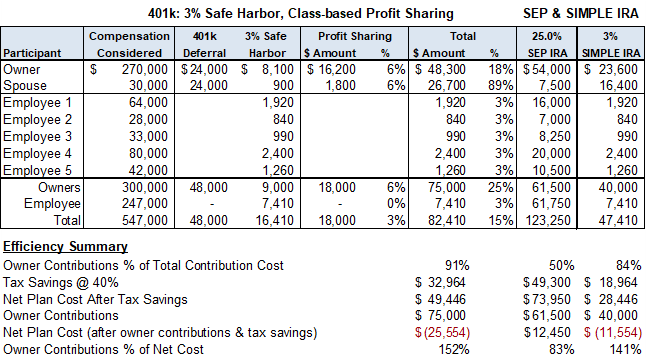 The hypothetical examples in the tables below show why understanding your options is vital to help you as the owner to maximize your benefits. In this example, the SEP and SIMPLE IRA are inefficient designs. If you are looking to save more and minimize employee contribution costs, we partner with TPAs and actuaries with specialized expertise to help you maximize your benefits and remain compliant with the IRS. Are you serving as a 3 (38) fiduciary? Will you accept the 3 (38) status in writing with a clear written description of fees and services covered? If not, why not? Which fiduciary duties do I, as Plan Sponsor, still retain? If you are interested in supercharging your tax deductions and retirement savings, more advanced plan designs may be an option.